East Fork Trail - San Gabriel Mountains - Beyond Limits on Foot! To get to the trailhead: Take 210 freeway, in Azusa take Route 39 North. After 11.6 miles and passing two reservoirs (Morris and San Gabriel) turn right at East Fork Road. Take East Fork Road 5.2 miles. If you do not have an adventure pass you can get one along the way on your left side at a small cafe about 4 miles in. Once you hit a sharp turn at 5.2 miles, make sure you continue straight on Bonita Prairie Parks Road. This Road sticks close to the river and about 3/4 mile ahead is the trailhead. Good luck finding parking if you are not there early enough. Driving up on the 39, we lost gps signal and had to find our own way up. Good thing I printed out explanations of how to get there. We didn’t have an adventure pass with us and again didn’t have enough cash to buy the annual pass. We stopped at a small cafe on East Fork Road to get the pass and continued straight to the trailhead, only to find that there was absolutely no parking. From this we took it that this must be a popular place. After parking in the last possible spot about .5 miles down the road we packed up our things and headed up to finally begin our 11.2 mile hike (I say that because we parked far from the trailhead, when in actually from the trailhead it is only 10.2 miles). You can also self-register yourself at a kiosk at the trailhead. We hit the trailhead around 11:15 am – destination Bridge to Nowhere, 5.1 miles away. It was hot and muggy, but with the little gusts of wind and scattered shady spots we were able to get through the heat. This trail is heavily traveled and there really isn’t an easy way to get lost. If you happen to lose the trail stay by the river and go upstream. You will hit trails that will lead you straight back up to the “main” trail. This happened to us a few times as we scrambled and crossed the river about 7 times. The last stretch of a couple miles were completely out in the open (no shade) and lots of up and down. We reached the bridge right under 2 hours. The trail the bridge is gradual and there is a lot of rock scrambling. Be prepared to cross the river and get wet, though we didn’t, but during the winter and spring, the river is known to have knee-high deep water. Bring a towel and the right shoes for this hike. Some of the river encounters are optional and some are not. You will have to cross the river. I know some of you are thinking is there water, it’s Los Angeles? Yes, there is water throughout the year. Many sightings of many yucca plants (not in bloom) and poison oak (close to the river areas). The phrase “bridge to nowhere” is used because the bridge literally goes nowhere. Little do people know that this is because of a lack of financial investment that created this excellent destination for hikers or bungee-jumpers (above $80). 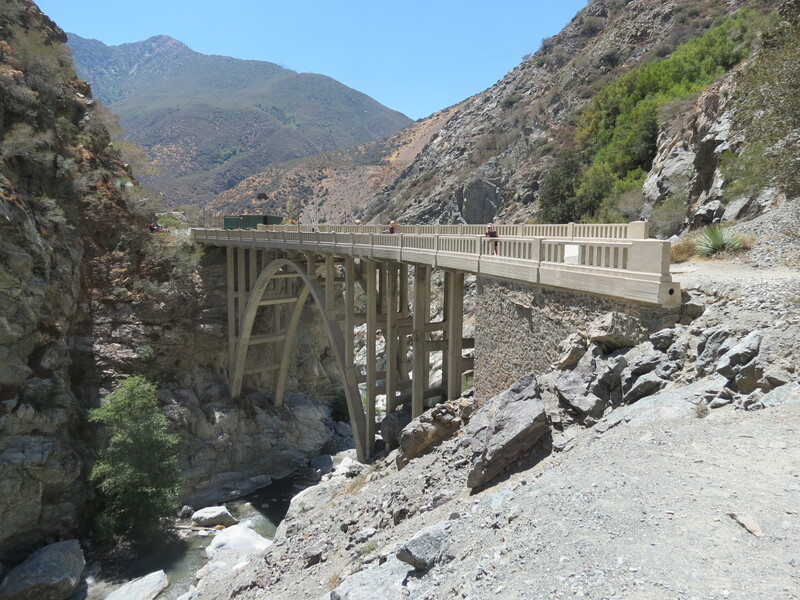 1936 this road and bridge were built to connect San Gabriel Valley to Wrightwood. 1938 nature had a different idea in mind and a flood reconstructed the landscape of the valley. Construction was abandoned and road was never restored. 2013, we ended up going nowhere. We only stopped at the bridge for 10 minutes as we saw the pools below were overflowing with fellow hikers. We wanted seclusion and seclusion is what we searched for. We headed back down for about an hour and half and after passing some potential pools we found one in the shade, We stuck to the east side of the river the whole time back and only crossed the river 4 times. Before getting to the pool we had several encounters with the following: 2 people carrying their dogs (not rats) on their back, 2 gentlemen I think mining for something and a gentlemen right up the stream pumping some device and throwing rocks (not sure what he was trying to accomplish). One interesting fact: there are so many different trails to go on – we did not take the same route up as the route we ended up on the way down. The trails get washed out easily (flash flooding) and there are many small trails that lead to nowhere as well, make sure you scramble near the river (though getting lost is very tough). Though we heard the passer-byers on the trail above us, we still felt somewhat isolated in the pool we were now soaking in, until little fish decided to peck at our feet in the water. This did not bother us as we used this opportunity to have a cold refreshment and soak some more. I have to say those little fish may have been hungry as they didn’t just “run” into us once, but many times. After enjoying the East Fork River’s offerings, we headed back to our car. Took us 15 minutes from the pool, which we were expecting to be a little longer – nice surprise – finish line reached! Note to self: Come early in the morning as parking overflow and trail overflow were not pleasant. Recommended: YES – you have to go nowhere once in your life.